A century ago, this place we call home was transformed by railroads. Today, old railway "bones" still shape our environment. On a recent Saturday at the Hillsdale Branch Library, Multnomah Historical Association President Tim Lyman invited us to consider our railroad bones. (The Association, despite its potentially misleading name, takes in the history of Southwest Portland — neither just the Multnomah neighborhood nor expansively the county.) Lyman gave an illustrated overview of five (yes, FIVE!) railroads and/or trolleys that once served this area. Two railways were started by land developers to provide a way for residents of new, isolated subdivisions to get from the "wilds" of Southwest Portland into "urbane" downtown Portland: ¦ The short-lived "City and West Portland Park Railway" (1890-1900) ran right through Hillsdale. Like the other railways, this one made its mark on Southwest. It trailblazed what would become Terwilliger Parkway and shaped Southwest Cheltenham Street. It wound its way from Southwest Hamilton Street (above Barbur Boulevard) to approximately the site of the present Capitol Hill Library in the West Portland Park neighborhood. ¦ The "Metropolitan Railway" (1890-1898) reached out to Fulton Park and the Riverview Cemetery. Evidence of the Metropolitan Railway can be seen along its Corbett Street route, most notably in the steeply sloped grade next to the "stepped"
street lane that climbs the hill starting at Southwest Idaho Street. A third local line, a trolley, served Portland Heights, but it is most remembered for its terminus on Council Crest, where it delivered passengers to a frolicking, lofty amusement park perched on the highest point in Portland. The trolley service lasted from 1906 to 1949, two decades after the amusement park folded. The trolley's rail bed today serves as a paved footpath for Council Crest Park visitors. Two lines — The Oregon Electric Railway (OER) and the Red Electrics of The Oregon & California Railroad (part of The Southern Pacific) — were sprawling interurbans, connecting Portland with the small towns and villages springing up in the dairies and farmlands to the west and south. 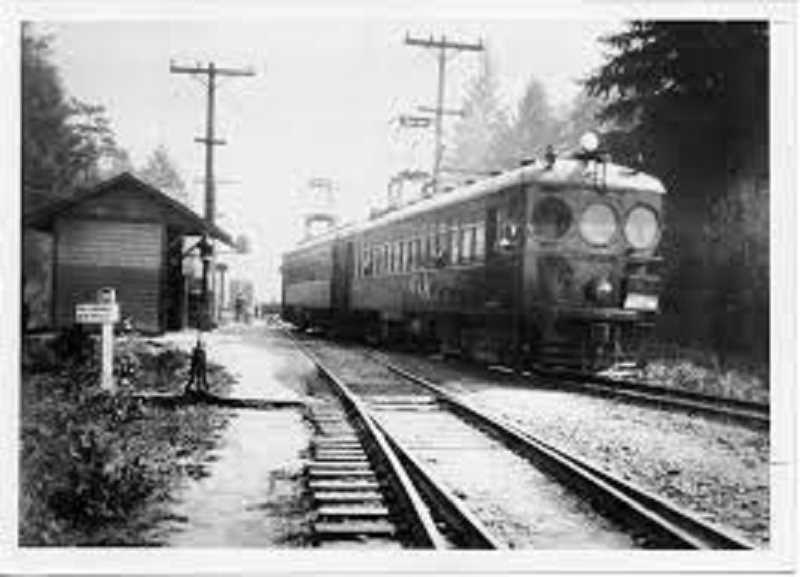 ¦ The Oregon Electric Railway reached all the way down the Willamette Valley to Eugene. Its passenger service lasted from 1912 to 1933.
that "Bertha" became the name of the Hillsdale Red Electric stop and almost became the name of the current "Hillsdale." Prior to the station's being named "Bertha," it was called "Summit," as the highest point on the line. That name was abandoned after it was learned another community had already taken it.) Ultimately the dominance of automobiles, trucks and buses doomed the trains. Ironically, trains, in the form of light rail and trolleys, now are on the rise again as a partial solution to the congestion caused by individualized transportation. Even as the old rail lines have left marks on the present, they are defining the future. The proposed and much anticipated "Red Electric" foot trail will one day follow the train's old course westward. The interurban lines shared the rail route that ultimately became Barbur Boulevard. Now Barbur is being considered as the route for the anticipated Southwest Corridor MAX line. Like its predecessors, MAX is electrified — late to the "electrified party." One day, MAX "bones" may be left for future generations to ponder. What will the legacy of light rail be in 100 years? If you want to experience more of the history of Oregon's electrified trains, visit the Oregon Electric Railway Museum in Brooks, just off I-5 south of Wilsonville. For more information, visit museum.oregontrolley. com. The Multnomah Historical Association's website also has links to excellent illustrated pages on each of the rail lines mentioned here. Thanks go to Tim Lyman for his research.